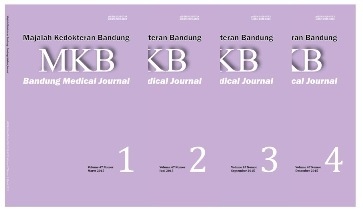 Majalah Kedokteran Bandung (MKB) publishes peer-reviewed original articles in basic medical research, clinical research and case report. This journal is published quarterly (March, June, September, and December) by Faculty of Medicine Universitas Padjadjaran. Articles are original research that needs to be disseminated and written in English. All submitted manuscripts will go through the double-blind peer review and editorial review before being granted with acceptance for publication. Majalah Kedokteran Bandung was issued for the first time in 1967. MKB recieved the ISSN 0126-074X for its printed version in 2007 and starting from Vol. 41 No. 1, 2009, it has also recieved the ISSN 2338-6223 for online version, accordance with the policy of LIPI. Therefore, our publication during March 2009 till December 2014 was back issued. Majalah Kedokteran Bandung (MKB) is accredited (2016-2020) by National Journal Accreditation (ARJUNA) Managed by Ministry of Research, Technology, and Higher Education, Republic of Indonesia with Second Grade (Peringkat 2, Sinta 2) (No. 21/E/KPT/2018). Abstracted and indexed in: Portal Garuda, IPI, ISJD, SINTA, Google Scholar, DRJI, EBSCO host, CiteFactor, BASE, Crossref, DOAJ, etc. This is another milestone for our Journal, Majalah Kedokteran Bandung (MKB). Starting from December 2018, all articles submitted to Majalah Kedokteran Bandung should be in English. If your articles is still in Indonesian. Please do not hesitate to contact us.